DB2 - The first Aston Martin to carry Sir David Brown's initials, early prototypes were powered by 4 cylinder engines designed by Claude Hill. The production series models had 6 cylinder 2.6 litre units developing around 105 bhp. Production totalled 400 units with around 97 of these being in convertible form. In 1953 Motor magazine recorded a 0 to 60 mph time of 11.2 seconds. DB2/4 - Introduced in 1953, it was followed by the MkII which ran through to 1957. The DB2/4 provided 2+2 seating and a more powerful 125 bhp 2.6 litre engine which was subsequently enlarged to 2.9 litres. A one piece front screen and raised rear roofline distinguish this model from it's predecessor. Two body styles were produced, saloon and convertible. The saloon featured an opening rear door and folding rear seats - one of the very first hatchbacks. DB MkIII - Built between 1957 and 1959 this further derivative of the DB2/4 featured significantly revised engines with new block, crankshaft, camshafts and manifolds. Power was up to 162 bhp from the 2.9 litre capacity. The interior had revised instrumentation and Girling disc front brakes quickly became standard fit. DB4 - With styling by Carrozzeria Touring of Italy the body structure featured a platform chassis with Superleggera construction of aluminium panels over a small diameter steel tube framework. An all new Tadek Marek designed 6 cylinder aluminium engine of 3.67 litres produced 236 bhp. A total of five series were produced between 1958 and 1963. The convertible version was introduced in 1961. Both Vantage and GT engined models were offered with cowled headlamps similar to the DB4GT. DB4GT - Launched in 1959 around 100 vehicles were built including 19 with Zagato bodies. With a shorter wheelbase and overall length than the DB4 these vehicles could also be distinguished by their cowled in headlamps and twin fuel filler caps. The 3.7 litre engine fitted with 45DCOE Weber carburettors produced 302 bhp. DB5 - Derived from the DB4, the engine was enlarged to 3995cc with triple 2 inch SU carburettors and developed 282 bhp at 5,500 rpm. DB5 was the first car available with air conditioning. The Vantage version, fitted with Weber carburettors produced 314 bhp. Production ran from 1963 through until 1965 with a total build of 1021 units. Around 10% of these were in convertible form. Another body derivative was created by Harold Radford in the form of a Shooting Brake. 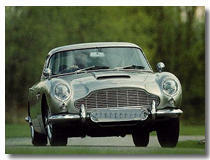 DB6 - In 1965 a major update to the DB5 saw the introduction of the power assisted steering option. Both manual and automatic transmissions were available at the same price. The bodywork featured a squared off rear tail with upswept spoiler and split front and rear bumpers. The Volante model included electric operation of the hood. Later models had AE Brico fuel injection systems fitted. Production of the MkII version ended in 1970 after a run of 1755 units.